I'm wallowing in a sea of tissues and self-pity today. Mind you, it's my first stinky cold since the summer so I guess I've done pretty well to last this long. I know a lot of people consider Inhaler sticks as unhygienic but I love 'em! It being January, I do like a project. This year, Blondie Daughter and I are swapping rooms. 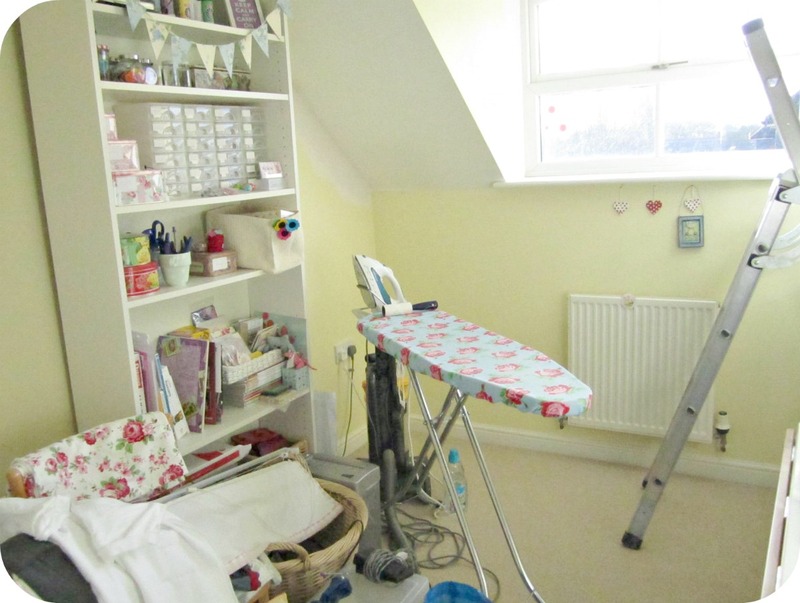 She currently has a big bedroom at the front of the house and I have a smallish craft/ironing room at the back. She is the messiest child I have ever come across and I mean SERIOUSLY messy. For ages I have been threatening a room swap, thinking in some misguided way this might encourage her to mend her slovenly ways. Anyway, in a rather sweet moment last week, she confided that she thought that "perhaps, maybe" her room is too big for her to keep tidy. She really rather "likes the idea of a smaller, cosy room". Well, she'd barely finished the sentence before I was making plans! Unfortunately D has stepped in and flexed his DIY muscles, insisting we first address a few minor structural issues. 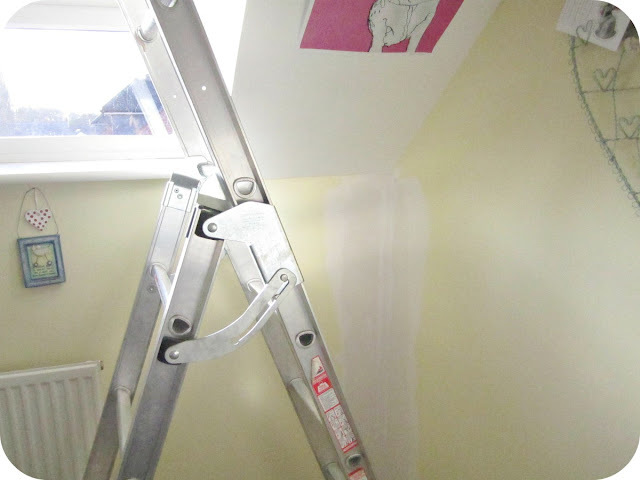 We bought our house from new ten years ago and, in certain areas, big cracks and chips in the plaster have appeared. I'd gladly waft a paintbrush over and ignore them but Mr 'Let's Do Things Properly' has been quite adamant. My poor little craft room in it's current state. Blondie Daughter's bedroom. This is it tidied, honestly. No, I really am excited about the project but just finding it a little hard to get going today. So that's me today. I'd better galvanise myself into some sort of action and get started. Come to think of it, another quick cup of coffee and a good nose blow first. PS. 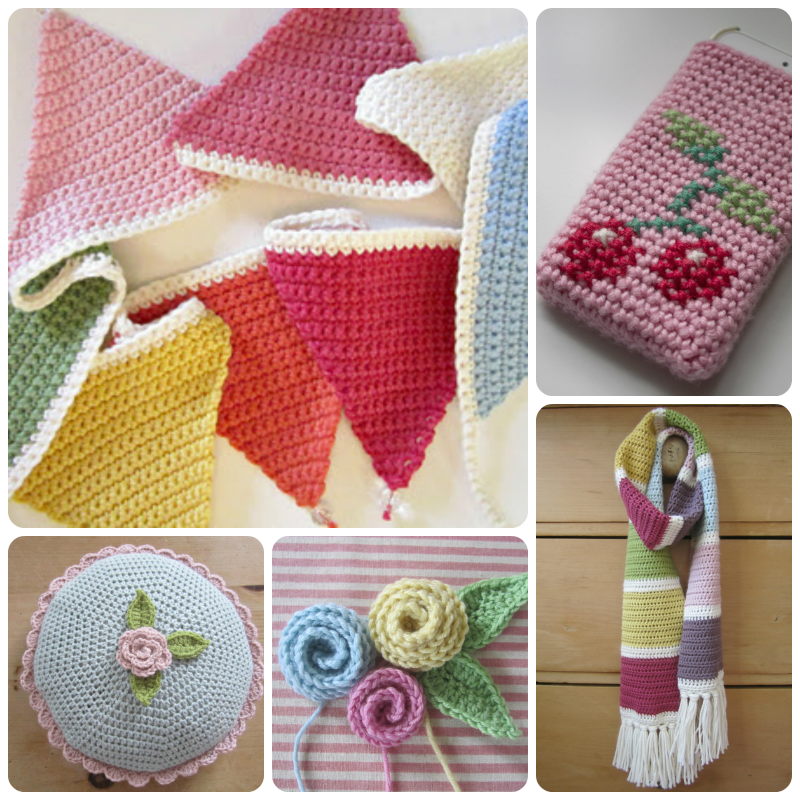 My bloggy friend Cathy has just opened up a new Etsy shop. If you fancy browsing her vintage bits and bobs, do pop over for a look. ooooo how exciting! A "new" craft room! I'm always more productive after re-organizing or getting a new space. I hope you feel better soon. Thank you so much for the Etsy link - that was very sweet of you, and for your lovely comment on my post. Its' quite scary getting started, so I am very grateful. 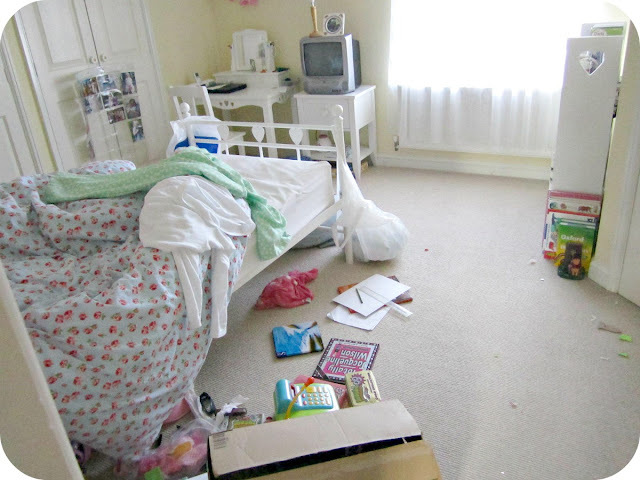 In return I can post some photos of some truly messy bedrooms if it will make you feel better! How exciting though to have a bigger room to get creating in. I hope the cold doesn't hang around long - I always find steam and a mug of Bottlegreen hot ginger and lemongrass squash sets me right. Feel sorry for you? FEEL SORRY for You? No I bloody don't. I'd kill to have my husband do a bit of DIY and I'd eat my own children to have a craft room!!! I do feel sorry for you having a stinkin' cold though. that's poopants for sure. Colds are really yuk and if a nose inhaler thingy gets you through the day, I'd be all for it. Mmmmmmm, new craft room, that's just a bit exciting. My craft room is shares space with an electric piano, home brew beer and ginger beer plus the kit it was made in, a messy filing cabinet, old outdated compter moniters and other stuff belonging to DH. Oh I forgot to mention the tool box. My big girl now vets every item of clothing I buy for her, as she just won't wear it if she doesn't like it, which is incredibly annoying BUT I suppose as they grow they have their own ideas and that's good....right???! Ooh how lovely for you, and very sweet of your daughter to swap. You think her room is messy? Just wait for the teenage years! oooh a craft room you lucky thing - what i would give for a room of my own ! As for girls and bedrooms can completely sympathise , there are days when you cant actually see the floor , beds or desks in my girls room - only mess , junk and piles of clothes !!! OOOh how exciting to have a new craft room, you will enjoy it very much! I love your clock in the top picture, so pretty! 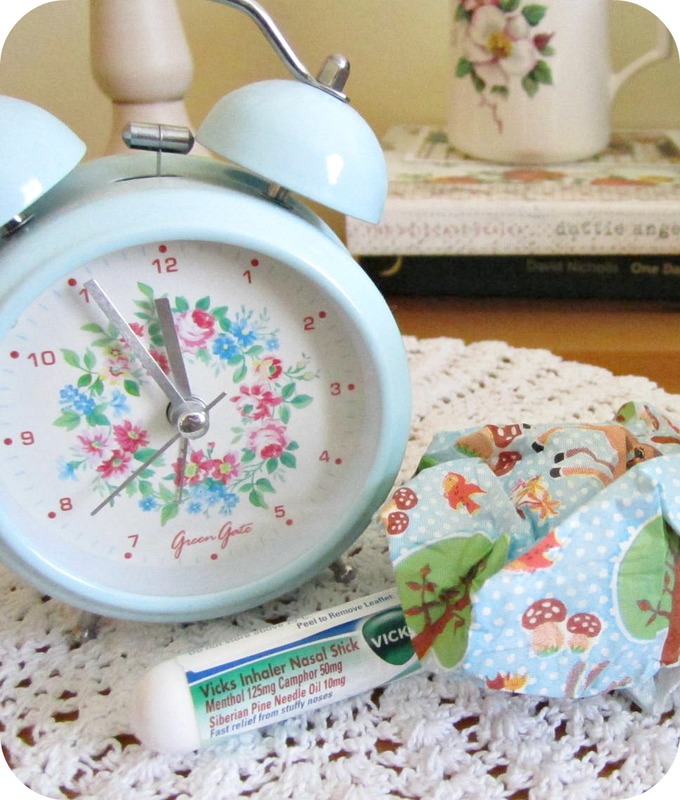 Hope your cold is soon better, but in the meantime enjoy those pretty tissues! OOhh exciting for you to have a big room to play in! But how typical of man to spoil the fun by doing the boring bits - my hubby is the same, obsessive crack filler, also careless of my things too - no respect for my "stuff" - even been known to sit on stuff its in the way, sigh. Def a man thing. Made me lol to see your daughters room - looks familiar somehow only I think my daughter's maybe worse! I hope you’re a bit better now....I can't wait to see your craft room finished. I need to have a good sort out in mine. Bless her, you should of seen my room when I was her age. Everything has to be really tidy now, it's funny how you change. There is hope for her yet!